GCSE success for our Class of 2018! At 9am sharp this morning our school was buzzing with hoards of nervous students eagerly awaiting their GCSE results. There were happy faces, tears of joy and big plans as our students enjoyed another year of fantastic results. We are more than proud of the fantastic achievements of our ‘Class of 2018’. Collectively, and individually, they achieved some amazing results and their five years of hard work, perseverance and dedication have now paid off. We also witnessed some very outstanding individual results with A*s and Grade 9s in abundance! 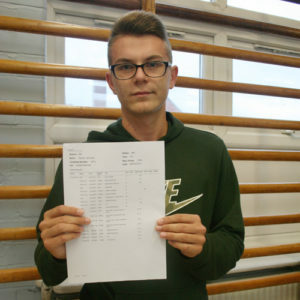 Joseph is moving on to Pendleton College to study Maths, Chemistry and Physics and will hopefully go to university. When we spoke to Joseph he said; “These results mean I can now go to college and university. The secret to my success was…revising as much as possible and trying really hard during the exams. I enjoyed my time at Co-op Academy Swinton because of the friendly staff – they helped me to concentrate and achieve. Ariale’s long term plans are to do some humanitarian work, helping people across the world who are in need. 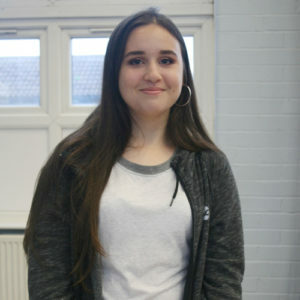 When we asked Ariale what these results meant to her, she said; “They allow me to continue with my future plans…and will make my Mum so happy!.” We also asked what was the secret to her success and she said; “Revision sessions and always asking for help.” She also said that the friendships she formed here and the opportunities she was given were the things she most enjoyed about Co-op Academy Swinton. NB: The grades listed above are the number of A*-G grades with A*-C in brackets, followed by the number of 9-1 grades with 9-4 grades in brackets. In other areas of success, some of our students made massive leaps in progress (P8 scores). Huge congratulations go to; Ryan Southwell, Ryan Bluer, Elenor Stelfox and Ellie Dunn who all made incredible progress since joining us since primary school and they were our top four progress achievers. 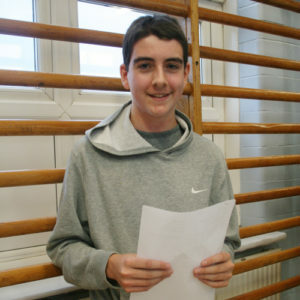 Sports Studies also enjoyed a terrific set of results with many students achieving D* (Level 2). A massive well done to; Hollie Booth, Lucy Budsworth, Emmanuel Diamond, Rory Howcroft, Millie Keegan, Declan Midgley, Georgina Mogridge, Ryan Nelson, Oliwia Rydz, Leah Slamon, Ryan Snaith and Spirion Spirovski. Well done Year 11, you worked so hard and we are incredibly proud of your achievements. We hope you are pleased with the results you received today and wish you the very best of luck in your next steps, whichever path you choose to follow…we know you all have bright futures ahead of you! Home > Stories > GCSE success for our Class of 2018!